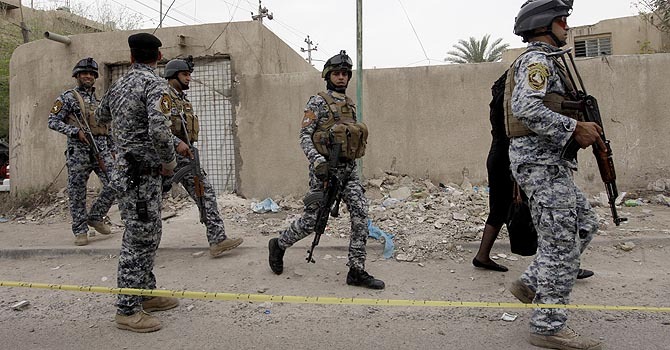 Islam Around Us: Bombs, shootings kill at least 47 across Iraq, say police. Bombs, shootings kill at least 47 across Iraq, say police. BAGHDAD | REUTERS | 26 Aug 2013 :: Car bombs, roadside bombs and shootings killed at least 47 people in Iraq on Sunday, police and medical sources said, as tensions intensify between Sunni and Shia Muslims across the Middle East. Sunni Muslim insurgents and the al Qaeda-affiliated Islamic State of Iraq have significantly increased their attacks this year. More than 1,000 Iraqis were killed in July, the highest monthly death toll since 2008, according to the United Nations. More than two years of civil war in neighbouring Syria have aggravated deep-rooted sectarian divisions and shaken Iraq's fragile coalition of Shia, Kurdish and Sunni factions. The renewed violence, eighteen months after the last US troops withdrew from Iraq, has sparked fears of a return to the scale sectarian slaughter in 2006 and 2007. Iraqis have suffered extreme violence for years, but since the start of 2013 the intensity of attacks on civilians has dramatically increased. Bomb attacks have increasingly targeted cafes and other places where families gather, as well as the usual targets of military facilities and checkpoints.